The Galaxy S10+ is Samsung’s latest flagship for 2019. It has a bright 6.4-inch AMOLED display and has a hole-punch design. While the hole-punch does sacrifice a small portion of the display, it isn't distracting. The display is crisp and gets really bright when outdoors. Samsung has picked the Exynos 9820 to power the Galaxy S10+ and has paired it with 8GB of RAM and 128GB of storage. You do have more RAM and storage options available with the top end offering 12GB RAM and 1TB of storage. Samsung ships the phone with OneUI running on top of Android 9 Pie. The software is also optimised to function with the hole-punch display and you get the option to hide the camera hole using a black bar at the top. Performance of the Galaxy S10+ is impressive and it managed to score higher than most other Android smartphones in our benchmark tests. The Galaxy S10+ gets a 4100mAh battery and is capable of delivering over a day with regular use. 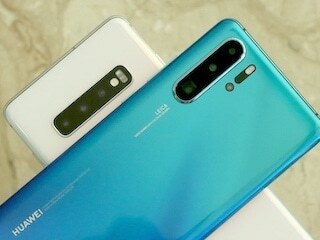 There are three cameras at the back of the S10+ consisting of a 12-megapixel wide angle sensor, 12-megapixel telephoto lens and a 16-megapixel ultra-wide angle sensor. At the front, it has a dual camera setup consisting of a 10-megapixel selfie camera and an 8-megapixel RGB depth sensor. The S10+ clicks some very good photos in different lighting conditions and the ultra-wide angle sensor does come in handy when clicking landscape shots. 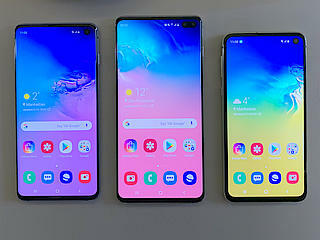 Samsung Galaxy S10+ smartphone was launched in February 2019. The phone comes with a 6.40-inch touchscreen display and an aspect ratio of 19:9. 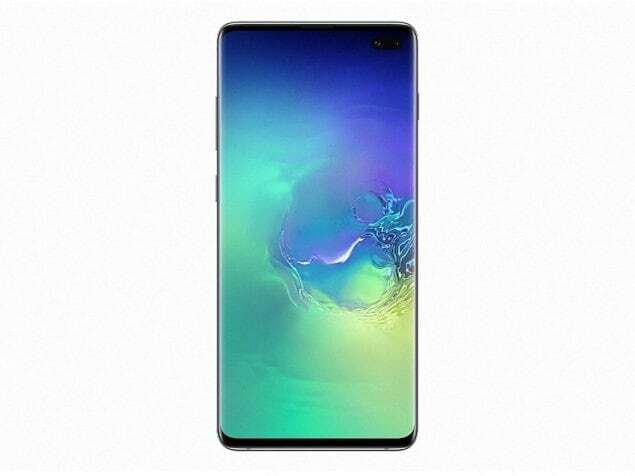 Samsung Galaxy S10+ is powered by a 1.9GHz octa-core Samsung Exynos 9820 processor. It comes with 8GB of RAM. The Samsung Galaxy S10+ runs One UI based on Android 9.0 and packs 128GB of inbuilt storage that can be expanded via microSD card (up to 512GB). 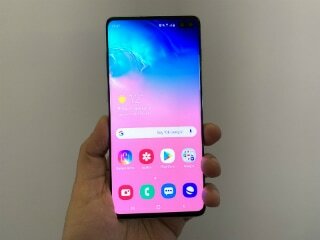 The Samsung Galaxy S10+ is a dual-SIM (GSM and GSM) smartphone that accepts Nano-SIM and Nano-SIM cards. Connectivity options on the Samsung Galaxy S10+ include Wi-Fi 802.11 a/b/g/n/ac/ax, GPS, Bluetooth v5.00, NFC, USB Type-C, 3G, and 4G (with support for Band 40 used by some LTE networks in India) with active 4G on both SIM cards. Sensors on the phone include accelerometer, ambient light sensor, barometer, compass/ magnetometer, gyroscope, proximity sensor, and fingerprint sensor. The Samsung Galaxy S10+ supports face unlock. The Samsung Galaxy S10+ measures 157.60 x 74.10 x 7.80mm (height x width x thickness) and weighs 175.00 grams. It was launched in Ceramic Black, Ceramic White, Prism Black, Prism Blue, Prism Green, Prism White, and colours. As of 21st April 2019, Samsung Galaxy S10+ price in India starts at Rs. 67,990.